In August I went back to Halifax, Nova Scotia, for my second grad school residency. As the weekend between the two weeks of school approached. Joanne, from the next year’s student cohort, confided to me that she worried about being lonely and depressed during those unscheduled weekend days. Remembering how I’d felt the same way the previous year, I invited her to join me. I had a plan for that mid-term Saturday. If I was writing a book about African Americans, and I was in Nova Scotia, wasn’t a visit to Nova Scotia’s historic black settlement the obvious thing to do? So that’s what Joanne and I did. 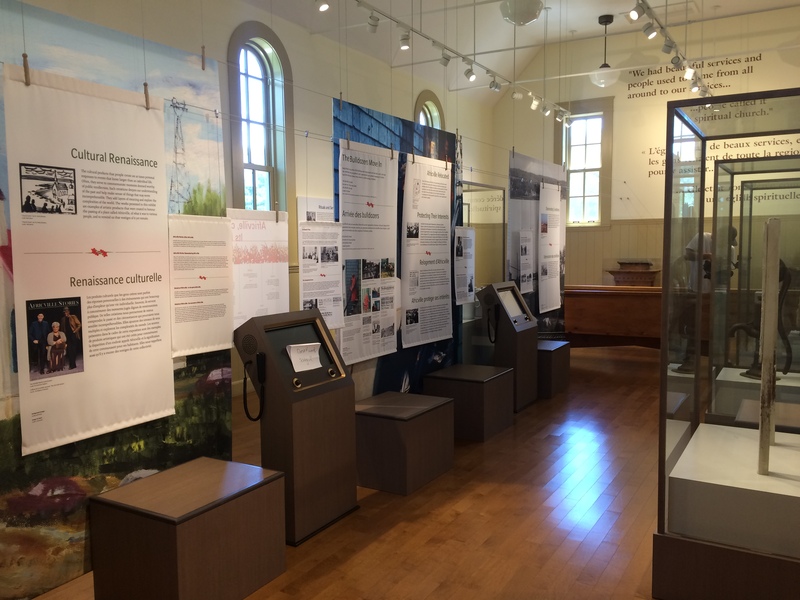 Africville was founded by Black Nova Scotians who mostly came from the United States—first as Black Loyalists freed by the British during the American Revolutionary War and War of 1812, and then as escaped slaves until the Civil War brought emancipation. Africville was located along the back of Halifax Harbor, at the edge of the larger white community. It was, by all accounts, a relatively happy and stable village. From the early 19thcentury to the middle of the 20thcentury, about 400 black people raised their children, attended their own Baptist church, and worked for the white folks in Halifax or ran businesses that served the village. They fought Halifax city hall for even the most basic services—a school, running water, sewers. But white Halifax refused those services to Africville—all they brought was a garbage dump on the empty land between the little community’s rocky beach and the mighty cranes of the industrial shipbuilders. Then, insult to injury, came the urban renewal craze of the 1960s. Africville was deemed a slum. The same zeal that Robert Moses inflicted in New York City swept Halifax. “Urban removal,” opponents called it, and that’s what happened to Africville—residents were offered vague promises of public housing to come, and removed as bulldozers pushed their community into rubble. The bulldozers came at night, without warning. The city loaned its dump trucks to cart the now-homeless blacks and their remaining possessions away. Africville never forgot that final degradation. Vacant land stood ready for the bridge-and-highway project city planners envisioned. But the tide turned on that plan, and nothing was ever built. The bulldozers returned to level the rubble, mound it with dirt, and seed it with grass. Nor did public housing come through for most of the displaced Africville families. Few people had held a legal title to any land, and a title was required to qualify for public housing. That Saturday morning in early August, Joanne and I arrived by taxi, because no buses ran close, and walking meant navigating an unsafe tangle of freeways at the west end of the bridge across the water. My imagination had painted a tidy row of modest shops and houses, maybe a storefront housing the history museum whose website I’d perused. Instead—we found NOTHING. Only a green meadow sloping to a rocky beach. One boxy little building. It turned out to be a replica of the original Baptist church, built to house the Africville Museum. Joanne and I stepped inside. A young docent told us what I’ve just told you, then left us to poke among the relics that comprised the one-room museum. A decorative plate, a hair comb, a vintage radio—the few objects traceable to the bulldozed homes and businesses. Oral history recordings played. After a nice chat with the museum’s director, we stepped back outside. Now that we knew what we were looking at, our eyes adjusted and we saw Africville around us. Small white signs like simple tombstones said things like “former location of post office.” A few beat-up trailers squatted at the margin where the beach met the grassy slope. “That’s Eddie Carvey’s camp,” the director told us, having followed us outside. “He’s been here since 1970. Today he’s in the hospital. He’s getting pretty old, not sure how much longer he’ll be keeping up the protest.” Eddie and a few other Africville refugees have kept up an occupation for going on fifty years now, despite occasional seizure of their trailers. 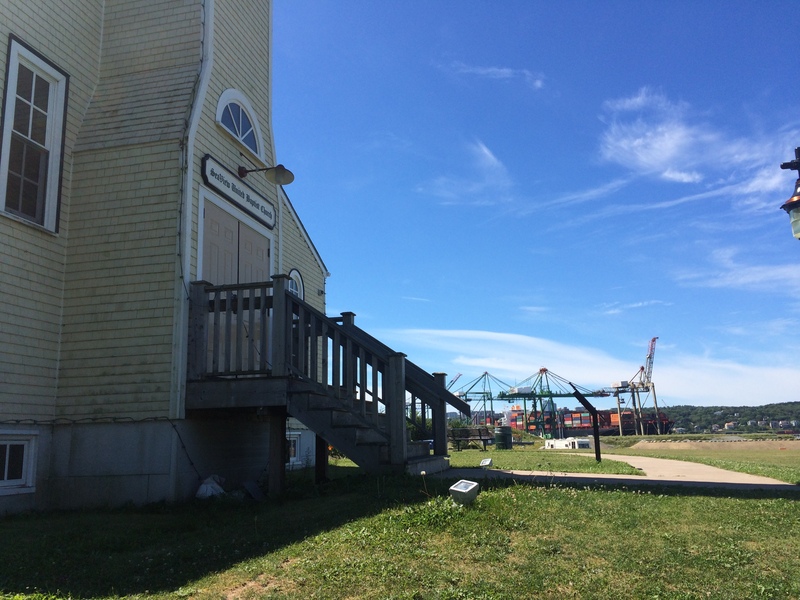 In 2002, Africville received an offer of the land Eddie watched over, as well as money and other resources, to build the replica of the church and start the museum. The community received a formal apology from the Nova Scotian provincial legislature in 2005. More recently, ex-residents have sued for financial compensation for the homes they lost all those decades ago. The case is still in the courts. A movement has emerged in Canada at the federal, provincial, and local levels to apologize to indigenous and minority populations for past ill treatment. Maybe the once-citizens of Africville will get more than an apology and a museum on a vacant stretch of harbor. Maybe no one will need to take Eddie Carvey’s place at the barricades. In the meantime, people like me visit, and are moved by Africville’s story. Joanne and I taxied back to the tourist zone along Halifax Harbor, where white people were smiling and taking selfies in the sun. But we could see beyond them, to the ghosts of Halifax’s dark past. Sarah, I loved your historical piece on Africville. Interesting facts about a sad event. I especially liked the last sentence. “But we could see beyond them.” The perspective of a traveler is so necessary in today’s world.